Do you want to be part of a Happy, dynamic and fun group of people that share the passion for Travel combined with Corporate sales? Then Happy Tour / FCM Travel Solutions is the team to join! We are looking for a real HUNTER (Business Development Manager) in our Corporate Travel division. 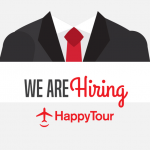 So, if you are from Cluj or the surroundings, want to work with some cool colleagues, and are eager to use and further develop your communication and sales skills, send your CV to office@happytour.ro. All we need from you is commitment, initiative, team spirit, ability to take responsibility, good knowledge of English, B2B sales experience and a lot of enthusiasm of course. We’ll take care of the rest! Can’t wait to meet you!